By the time your baby reaches six months, she may well have doubled her birth weight and be having four milk feeds and two to three meals plus snacks a day. At around this age, most babies start becoming used to a variety of solid foods, particularly infant cereal, fruit and vegetables. You may find your baby isn’t quite so keen at first, but fortunately she doesn’t need a lot – around 25g a day is enough. Tofu or pulses such as lentils, beans or chickpeas are also packed with protein and your baby might prefer the taste and texture of them. You should still be breastfeeding your baby, or bottle-feeding her with iron-fortified infant formula, continuing to do so until she’s 2 months of age. 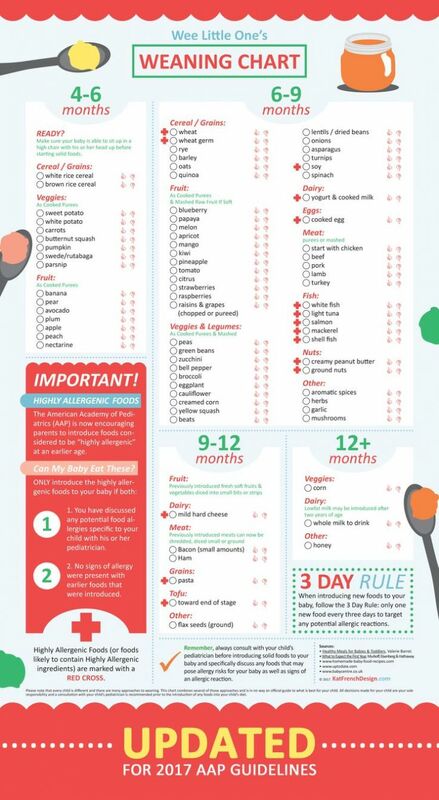 A typical feeding routine for a baby of 6-9 months is suggested opposite. If your baby is gnawing anything she can get her sticky little mitts on, it’s more than likely a sign that she’s getting ready to teethe. Your baby needs to develop her chewing skills, so you shouldn’t be pureeing food by this stage but mashing it instead with a fork or dicing it finely so it has a coarser texture. Always give your baby full-fat as opposed to low-fat dairy products (cheese, yoghurt, etc.). She needs the fat to enable her brain to develop. Its fine to give your baby small tastes of dairy products such as cheese after six months, provided there is no family history of eczema or dairy allergy. 8.30am Breast – or bottle feed. 12pm Lunch: finely chopped vegetables, beans lentils or tofu; minced pasta/ rice with fresh tomato sauce; scrambled egg yolks. (Only serve your baby eggs yolks – egg whites contain potential allergens it there is a history of allergy in the family, delay the introduction of eggs until after 2 months of age). 5pm Dinner: finely chopped moist chicken or fish (with all bones removed) served with mashed vegetables; custard and stewed/ soft fruit. A Complete Guide - When to start antenatal in Nigeria?